It was one of those December evenings in New York, way back in 2005. At around 5 pm, we three friends decided that we were badly in need of a microwave oven, given that the only oven the unit possessed was actually 'possessed' (Yeah, It seemed to have a mind of its own.) It sometimes worked and sometimes dint (OK, mostly it din't). As all of us were in a great mood for a walk, we decided to walk it up to the store to buy the oven. We reached there, found our perfect oven, paid for it and were deciding to leave. It was just about then that the snowing started. The guy who sold us the oven tried to call a taxi for us but in vain. At first we thought we would walk it up. But three ladies holding an oven in the freezing December snow of New York? After much deliberation, we decided against it. The store guy finally suggested that it may be a good idea to stand by the door of the store and flag down any passing taxi. So we three ladies walked to the door of the store and stood there in despair waiting for at least one taxi to pass by. The light snow slowly started turning into a blizzard and it was getting pretty dark too. Then like God send, we saw a taxi slowly passing round the end of the road. Jumping with joy, all of us started screaming and waving trying to get his attention (we were not just about to lose what would have been the only resort to taking us home). After much screaming, the guy finally noticed us. He braked the car, opened the door and shouted "whats wrong, Ladies?" It was only then that we noticed the flashing lights on the car and the very neatly written 'NYPD' on it. OK, there was nothing to panic. I slowly walked up to the car, pointed my finger at it, looked at the officer and very confidently (well almost confidently) asked "Taxi?" 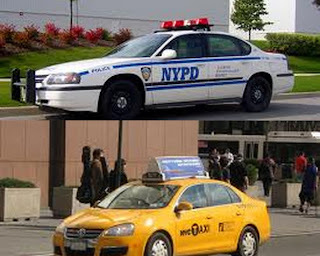 The officer let out a laugh which sounded like a scream "Taxi??! ha ha ha, ok , hop on, ladies, where should I take you?" "errr, we also have a microwave oven..."
It was worth seeing our other friends' faces when a police officer walked into the unit to drop off our microwave, before rushing off on his duty! Cute story! I love that about these moments in life, when the surprising happens. Also, says a lot about New Yorkers. My husband, Rob, and I were there for three weeks in the spring. Every single New Yorker we met was welcoming, warm, and patient with all my questions. Love the city!!! Yes Diana, completely agree with you. There are some really awesome guys out there in New York! hahaha glad you got home safe that night! I am really glad too, Caitlin. In some countries, I would have dreaded getting into a cop's car! I have to try this method next time stuck on the street here in NYC during bad weather! Yes Phil, you totally need to try it. Hey now!!!! I only break out the heels for special occasions! I have been laughing out loud reading this - fantastic story - love it! Thank you Cream punch, please do visit again! Hysterical and I'm so going to tell my sister in nyc to do that and she's so going to do that. I also totally commiserate with you on the possessed item. We had possessed television and wow, you could be sitting completely minding your own business and then whamo presto chango, it would start changing channels, looking for random shows, switch to the dvr, turn on the interactive part...yeah, it was intense. And of course you would be sitting there, fighting with the stupid television to stay on your particular channel. G-d forbid you were attempting to tape something! I do like me some good guy cops. That was a funny story, and cute. True or no?